Selling eBook is reserved to members with special “authors accounts”. So you must already have a comic published on Amilova to have access to the eBook interface. If this is not the case, to get special author’s account, you have to read the tutorial on this topic available on this page and follow the procedure. If you already have an author’s account, then it's easy! You just have to go on page "Manage your comics" and fill in the information for your eBook. Info 1 : As long as your eBook has been bought by the 1st reader, you can edit all you information relative to your comic. 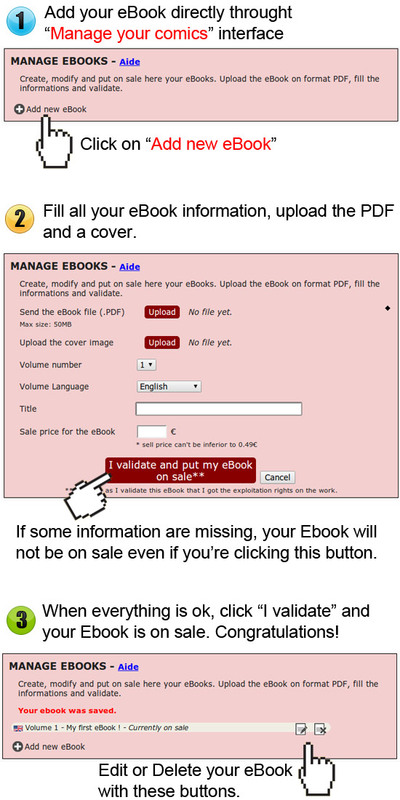 Warning , because once your eBook has been purchased, you can not change anymore informations. Info 2 : To get 85% on every sale you have to promote your eBook via affiliate tools available here . This way, you cumulate 60% + 25% payout sponsorship on all eBooks bought by your affiliates. Info 3 : You can not offer a free eBook. But you can use the free publication of your comic as a promotional tool, reminding your readers the availability of your eBooks and live out your comic. The more you give to your readers and the more they will support you. Info 4 : You're 100% free in the creation of your eBook. Color? Black and white? Chapter? Full Volume? Price? Everything is up to you. But we expect you to be responsible and use the shop wisely. Needless to sell an eBook too small, too expensive or of poor quality because your fans will be unhappy and that will bring negative outcomes for you and for us. In case of problem on your eBook itself, the customer will contact you directly. We are in charge of the technial aspects of the digital platform, you’re in charge of your own eBooks. Info 5 : You will receive an email for each sale. Do not hesitate to thank the buyer. This is a small gesture that has all its importance to retain your readers. To know where are your gains, check this page you will read your statistics and earnings here. Info 6 : You can not create an eBook that is not linked to one of your comics. If you want to create a new project and sell it exclusively as an eBook, you have to create a new comic and publish at least few free pages as preview. Info 7 Don’t forget to add a cover inside the eBook too. The cover you uploaded in the interface is used in the shop only, it won’t be seen in the final eBook. 2 - How to create a PDF? You can try to create a PDF automatically from your PNG/JPG, but the final result may be poor in quality, and disappointing for both you and your readers. 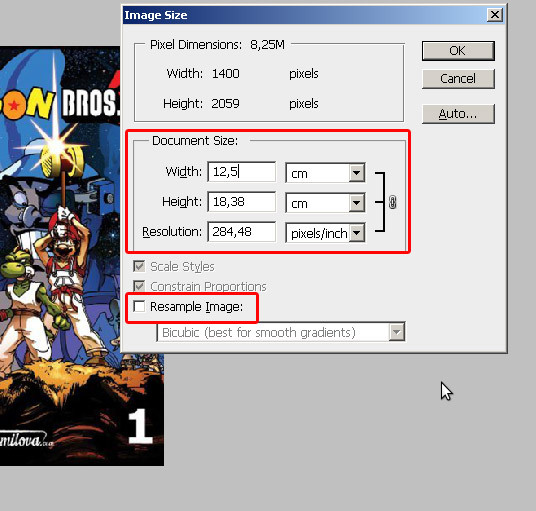 Here is a tutorial for Photoshop that explains how to export each sheet in PDF and how to assemble them. 2: If there are layers, do Layer »Flatten Image . 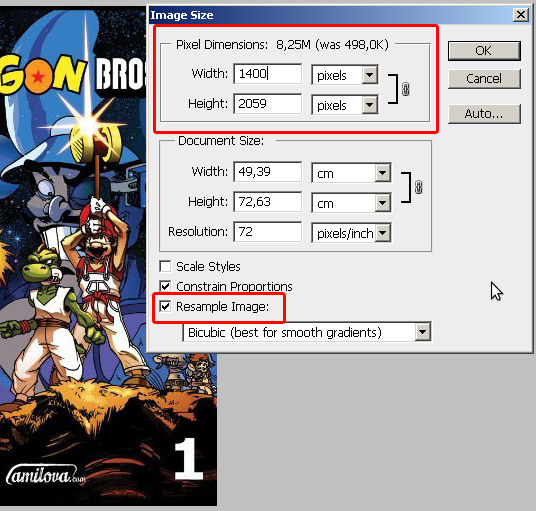 4: Resize your pages Image "Image size . Sufficient width: 1000 to 1400px. 5: Definition (centimeters): almost like to resize. Will Image "Image size and uncheck Resample Image . You can change the cm. Visually, it does not change but the PDF, it will make a significant consistency. 8: This is good! You can go to the next page. Installs software and launches it. In the left column, select Merge . Bottom: give a name to your file and launches final. Put your PDFs in the same folder with names that follow. Do not hesitate to speak about Amilova inside your eBooks, like that your reader will remember where does the comic he's reading come from. To do so, you can Download here a PDF presentation page. Thanks to Amilova.com, you now have several powerful tools for creating and promoting your art : do not hesitate to use all these tools ! Whether it is through the publication of illustrations/comics on your site, your blog, tools to send posts on all social networks and selling eBook, you have all the powers to create a special relationship with your readers and you build a fan base that will support your art creation ! It will require a lot of work beyond artistic creation... but this is the key to success!